Eseroline is a drug which acts as an opioid agonist. 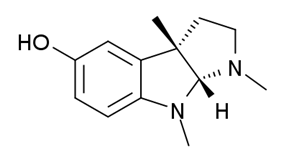 It is a metabolite of the acetylcholinesterase inhibitor physostigmine but unlike physostigmine, the acetylcholinesterase inhibition produced by eseroline is weak and easily reversible, and it produces fairly potent analgesic effects mediated through the μ-opioid receptor. This mixture of activities gives eseroline an unusual pharmacological profile, although its uses are limited by side effects such as respiratory depression and neurotoxicity.